A man had an idea and that idea spread and has inspired thousands of others. 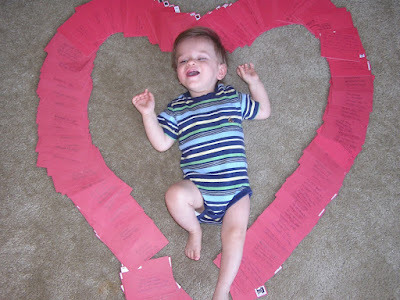 The idea would be to address empty envelopes and each envelope would represent the life of one child who had died due to an abortion. It is a true grass roots phenomenon. The red envelopes represent the innocent blood shed through abortion. The campaign is a symbolic act to flood the mail with red. To give a visual representation to the millions of souls that were our future. Children who could have been the first Woman President, the first African American Woman President, they could have cured autism, cancer, or diabetes. The list goes on of what could have been had these children been allowed to live. Our family took part in this day by addressing, writing and stamping 160 envelopes. My 23 week micropreemie son was born at an age when many are aborted. My heart breaks for the children who will never grow up, for the mothers arms who will one day ache for their babies and for the ignorance of a world that does not value life at all of it's stages. Liam is a testimony for Life. Look at that happy little boy. What a miracle, what a blessing.